Chances are if you’re reading this you’re fully aware how awesome Wingstop fries are. I can say with confidence their fries are in my top three best fries rankings. So what makes them so good? Aside from being a perfectly crispy French fry, Wingstop seasons them to perfection with a blend of spices undoubtedly includes sugar. That’s a dangerous combo, and my freshman 30 is a great example of what deep fried potatoes tossed in sugar can do for your waistline. That’s why I’ve chosen to lighten things up with my copycat Wingstop fries recipe and use an air fryer instead of frying them in oil. If you don’t have an air fryer, I’ll include notes on oven prep. 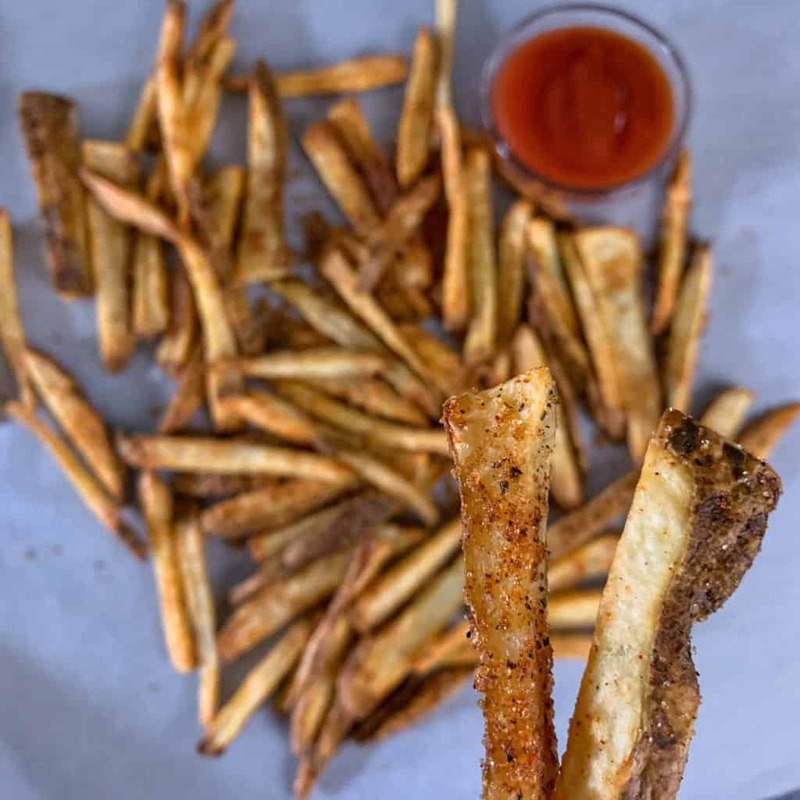 Thanks to the air fryer and a better selection of seasoning ingredients, this version produces nearly a pound of Wingstop fries that totals just 360 calories and 8 grams of fat. This recipe is really quite simple. All you’ll need for the fries themselves is a potato or two, some olive oil, and a pinch of salt. Let’s run through how I like to cut potatoes for fries. Start by washing the potatoes and drying off with a paper towel. 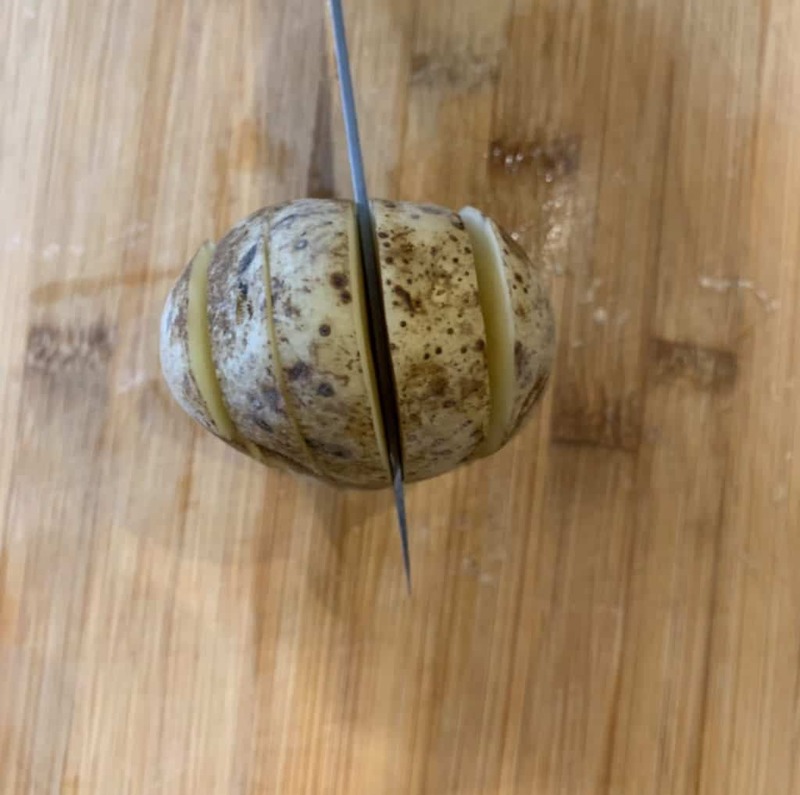 Then cut one end (just the tip) of the potato off so you can stand it up vertically without it rolling all over the place. After the potato is upright, slice from top to bottom 4-5 times depending on how thin you’d like your fries to be. If you cut almost to the bottom of the potato, it will hold together while you cut the remaining slices. Then you can easily finish cutting them all the way through. 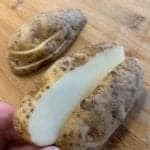 Once you’ve cut the potato vertically, split the potato in half (2-3 layers per side) and place the middle of the potato face down. You can see the outside of the potato facing up in the photo below. Then it’s as easy as slicing from one end to the other to create thin strips. And that’s it—fries. Some fries recipes may call for soaking the potatoes or cooking at low temperatures first, and those are valid methods for crispy fries. But a large part of my M.O. around here is that ain’t nobody got time for all that. If I had a couple hours to spare, I’d probs just drive to Wingstop and get a workout in, ya know? 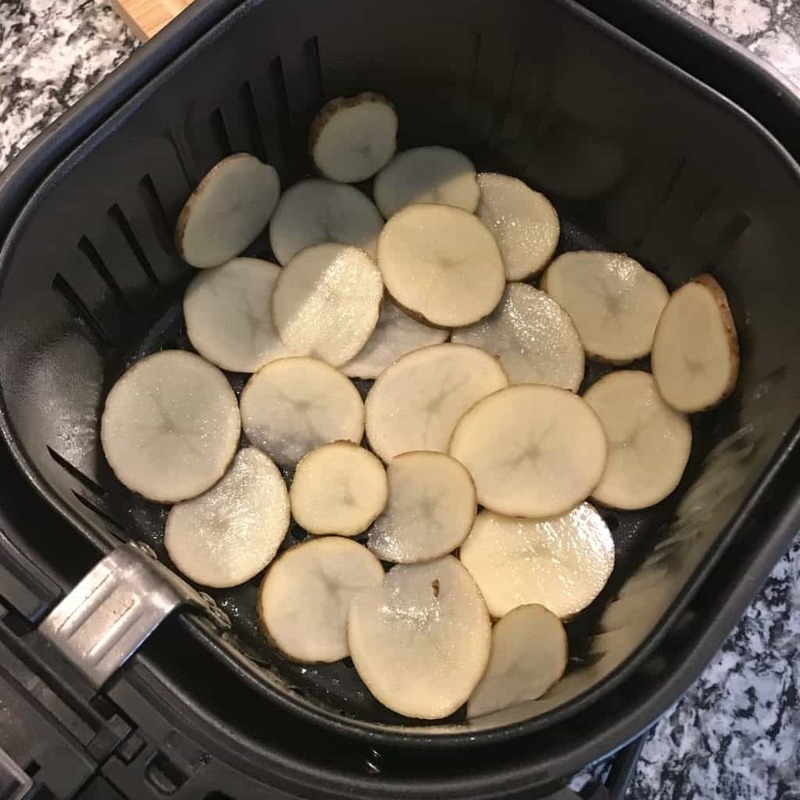 Therefore, after you have your potatoes cut, it’s straight in the air fryer. I’ve been using Simple Living Products’ 5.8qt Digital XL Air Fryer since they were kind enough to send me one earlier this year. It’s one of my favorite kitchen tools, and a tool I’d highly recommend for any savory, crunch-factor lover. Both a pro and con of my particular model is its size. While it’s nice to be able to cook an entire pound of Wingstop fries or air fryer potato chips, it does take up a bit of kitchen storage space. So keep that in mind if you’re in the market for an air fryer. If you’re using a different air fryer model, be aware that different air fryers may have different cook times. Keep an eye on the fries and periodically check them to make sure they’re not burning. We want crispy Wingstop fries, not inedible Burger King fries. 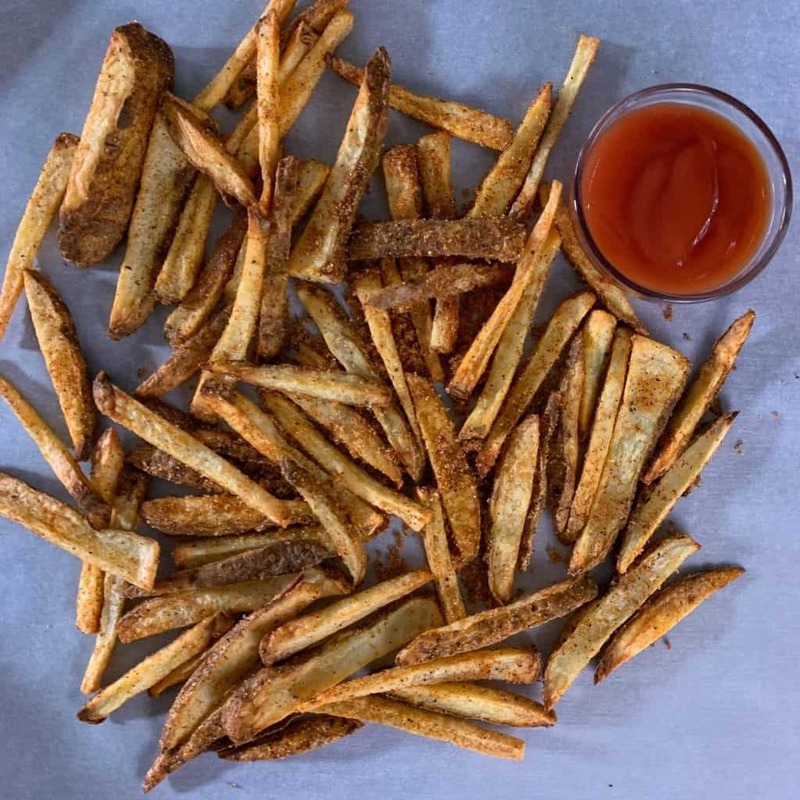 And if you don’t have an air fryer and want Wingstop fries this instant, I’d start with a hot oven and bake them on a wire rack or grated sheet so they evenly crisp without flipping every 5-10 minutes. I’ve included temp and time recommendations in the recipe card’s notes section below. Ah, the real magic. I’ve tried, let’s say, twenty different combos and I feel this is the closest blend to the real deal. Keep in mind, this is a lighter version. If you’re not concerned about saving the carbs and calories, use real sugar where applicable. Add ’em to a bowl, mix ’em up, and toss the finished fries in the blend. And there you have it, Wingstop fries with maybe a third of the calories and a fourth of the fat. I’m curious to hear how close they are the real thing. Let me know what you think on Instagram @mason_woodruff. And if you’re an avid air fryer or curious about what kinds of things you can make with an air fryer, check out all my air fryer recipes. 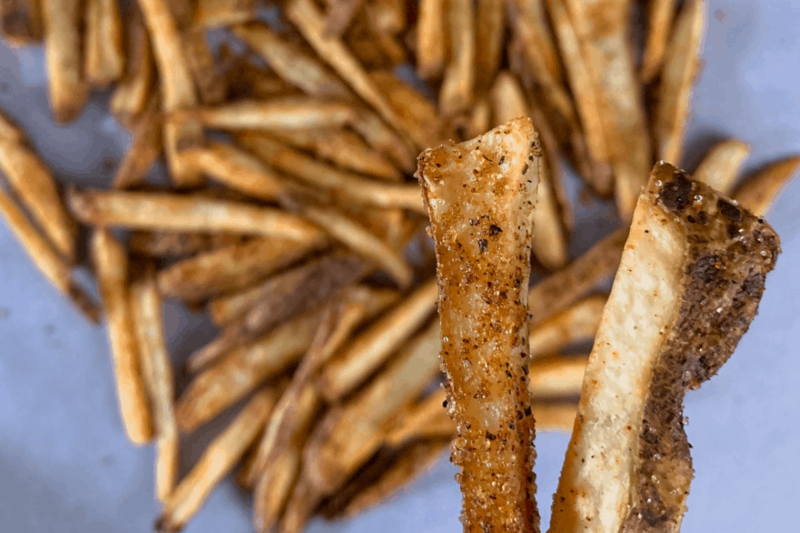 A healthier spin on the infamous Wingstop fries. Wash and dry 2-3 potatoes (about 400g total). 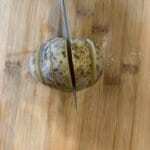 Begin by cutting the end off each potato to create a flat surface. Place the cut side down and cut the potato vertically into 4-5 pieces. The more you cut here, the thinner your fries will be. Divide the potato in half, keeping the sliced pieces stacked, and place the middle of the potato face down. Finally, slice lengthwise and you're done. Add the cut potatoes to a large bowl and drizzle with the olive oil and sprinkle with salt. Toss to fully coat all the potatoes. 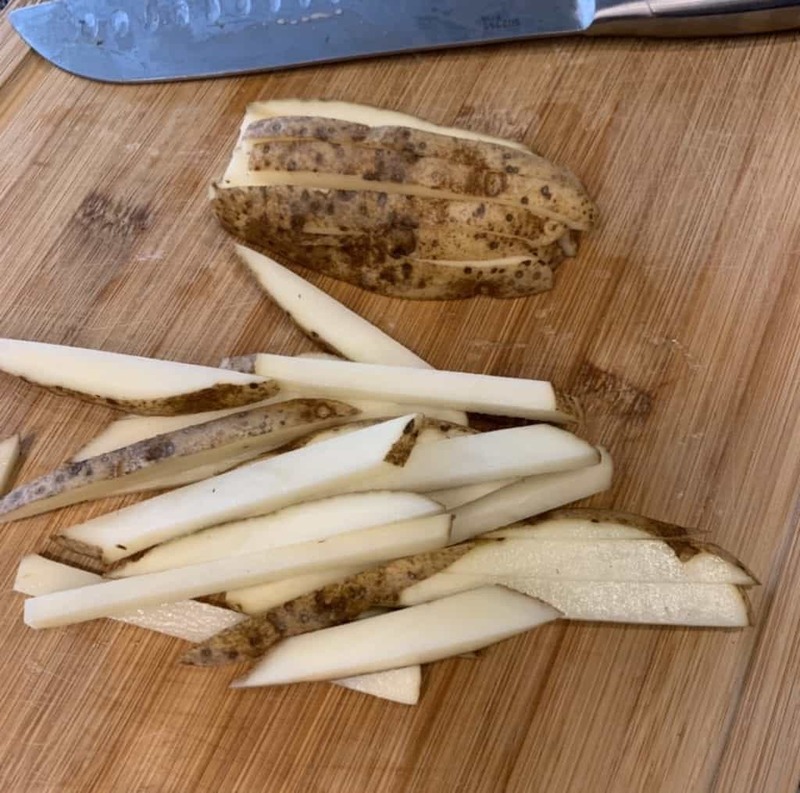 If you want to bake these fries, follow the same steps but bake on a wire rack or grated baking sheet at 450F for 15-20 minutes (or longer depending on how thin you cut the potatoes). If you bake them directly on a baking sheet, you'll want to flip/stir often to get them crispy. Don't be afraid to overcook, just don't burn them to a crisp. 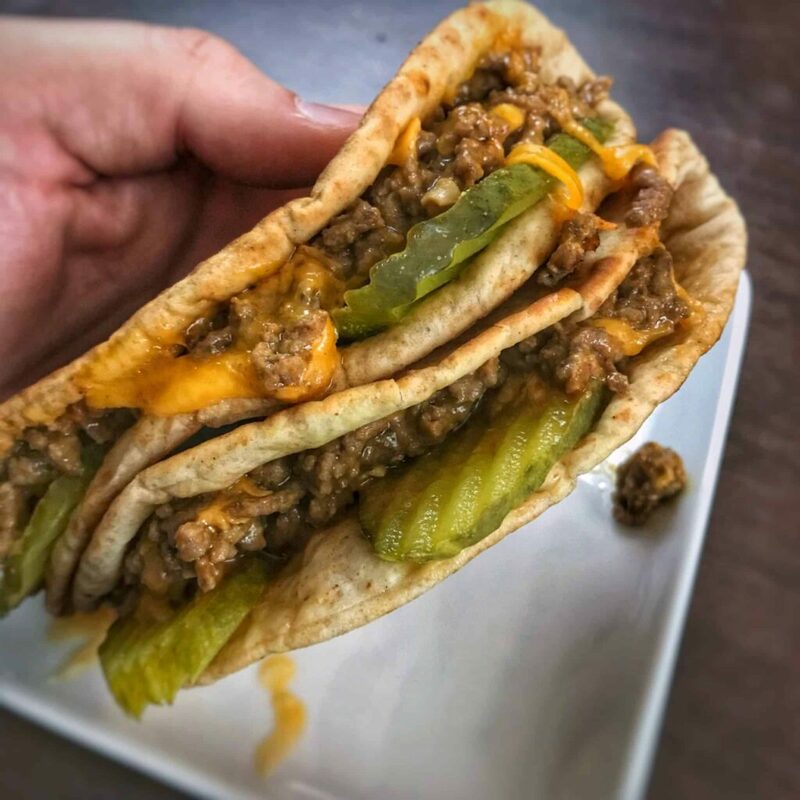 A cheeseburger quesadilla may seem unconventional, and that’s because it is. You’ll dig it, though. I promise. 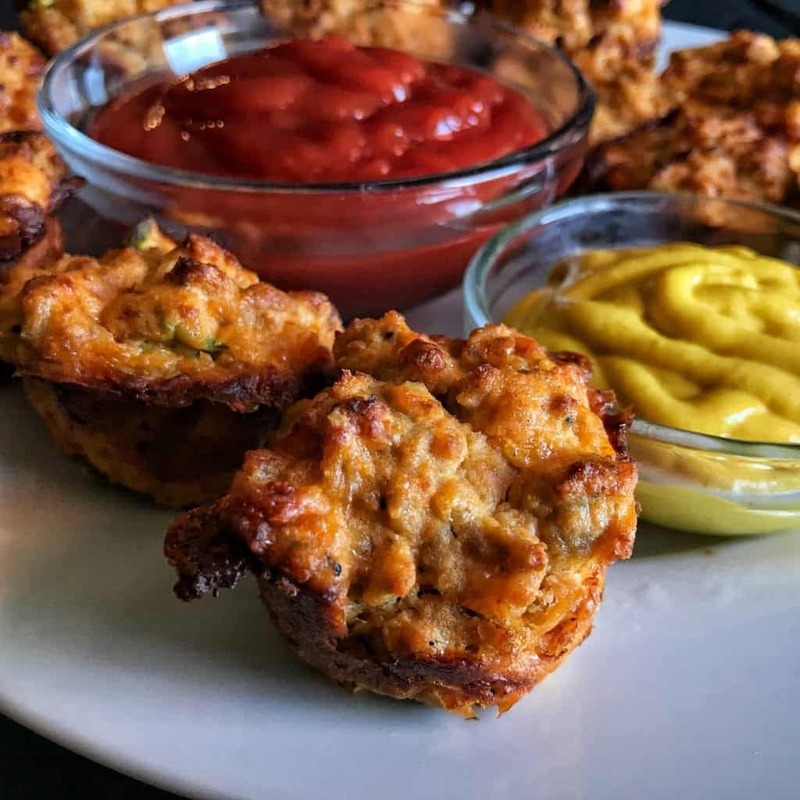 My healthy cheeseburger bites are one of the most popular recipes on my blog and for good reason. With 48 calories each, they’re one of my favorite ways to satisfy burger cravings without the carbs and calories. 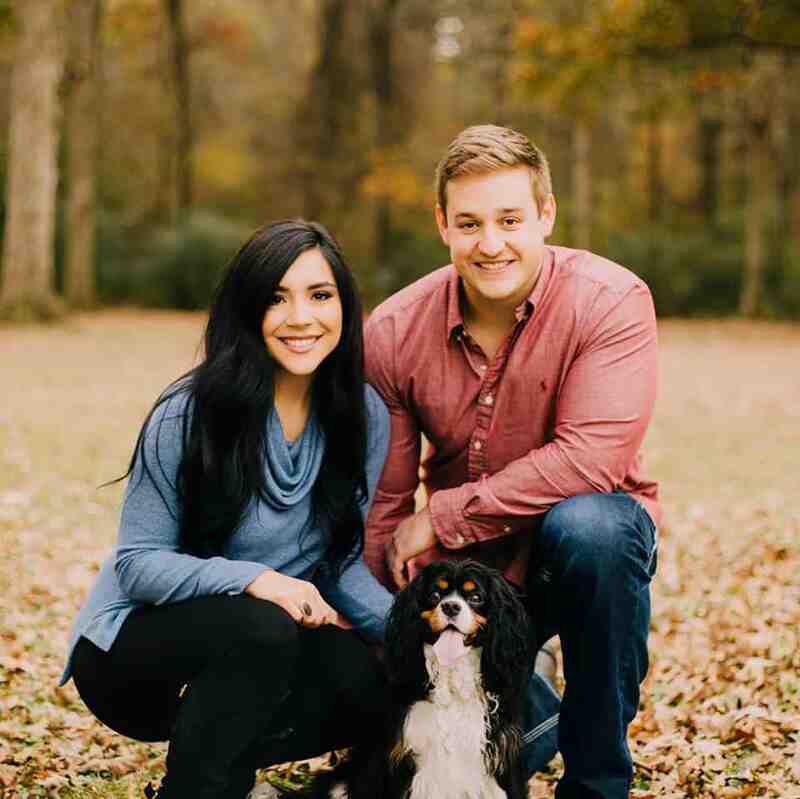 I almost never comment on blogs (sorry!) but this was totally worth the effort. You are a god send!! Wingstop are by far some of the best fries out there so a healthier version is just what I needed. Guess I need to go buy an air fryer now (mom has been nagging me about it anyway!). Thanks for this and all your other recipes! Love so many of them and so many on my list to try. Ha! Thanks so much for taking the time to comment. I hope you enjoy these and every other recipe you try. Let me know if I can ever help with any recipe or if you have any special requests. being able to enjoy fries, aaaand hit my macros is a win-win, thank you for this very detailed recipe! I’ve made these twice now and can’t get over how INCREDIBLE they are. DAT SEASONIN THO. I actually have these on my “menu” for tonight along with turkey burger. I’m more excited about the fries for sure. Go make these now. In your air fryer. If you don’t have one, go on, go get one. 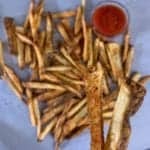 I’ve never had wingstop fries, but these are some darn good fries for homemade and NO OIL! Got an air fryer, potato cutter and a bunch of other cooking stuff for Christmas. This was the first recipe I tried and it was a success. I actually bought wingstop fries to compare at the same time with my friends and family and only 1 of 6 people could tell the difference and that was only because of the texture of the fry not the seasoning itself. Thanks for sharing, these are delicious. Oh man, that’s so awesome! I need to steal your idea and set up a blind taste test video for these. Ha! Thanks for the feedback and for trying the recipe. Duuuuuude. I consider myself a Wingstop aficionado. It’s definitely in my top 3 favorite places to eat out. Anyways, my whole family loves these fries, and my 10 year old son said they tasted just exactly like Wingstop. I’ll for sure be making these frequently. Thanks for giving me a healthier way to eat some faves! Now I’ll be waiting over here patiently for you to figure out their wings next (preferably garlic parmesan 😉). STOP WHAT YOU”RE DOING RIGHT NOW and makes these fries. they are BOMB! i literally have no tweaks or suggestions for improvement because these are amazing!!!! Can u fry them in oil on a stove top if you don’t have air fryer or a wire rack? You could bake them on a baking sheet and turn/shake them every so often to avoid using the oil and keep it lower calorie. Hope that helps! I just got an air fryer for Christmas and have been experimenting with it. This is hands down now one of my favorite recipes to make! I’ve never heard of Wingstop- they don’t have them up here in Vermont, but I think I need to go find one! I think my potatoes slices were a little large as it took longer than 25 minutes to make them nice and crispy but definitely worth it! These are so good. I’ve done them with carrots fries and sweet potatoes fries so far. Great way to get the kids to eat their vegetables! This was one of the first air fryer recipes I ever tried shortly after getting my air fryer. These fries came out so nice and crispy! I love how Mason showed a picture of how he cut the potatoe. It was very helpful and made for some awesome looking fries. Lol and who would have known brown sugar was a key ingredient! Definitely made these taste amazing! I highly recommend them!! I got an air fryer for Christmas and this was the first thing I had to make. So. Good. Never had the real wing stop fries but now I’ll never have to. Top quality fries that are better for my health and don’t require me to leave the house. What more can you ask?